The scholarly genre of the slim-volume-on-one-film and/or-TV-programme is a burgeoning one this millennium. BFI popularized the notion in the early 1990s with their Film Classics series, now at around 150 titles. The existence of that series begged the question: why not similarly svelte little books on individual television series? BFI would inaugurate a TV Classics series in December 2005 with entries on Doctor Who, Buffy the Vampire Slayer, The Office, and Our Friends in the North. By that time, though, they had been scooped by Wayne State University Press and their TV Milestones series, which debuted with J.P. Telotte’s Disney TV in March 2004 and Marcia Landy’s Monty Python’s Flying Circus in March 2005. Now numbering 22 entries, including volumes on The Wire and The Sopranos due in March 2013, the latest at the date of writing is Janet McCabe’s examination of The West Wing (December 2012). 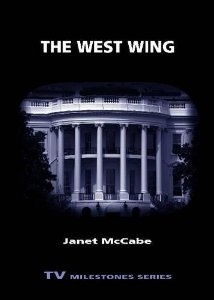 The West Wing (1999-2006) was one of the most popular (for a while), critically acclaimed, and award-winning shows on American broadcast television, as McCabe attests. By the end of its first two seasons, it had won seventeen Emmy awards, the Humanitas Prize, two consecutive Peabody Awards for excellence in television, and four Television Critics Association Awards, among a slew of others from craft guilds and various organizations. Indeed, its prestige is particularly striking given that it was produced by Warner Bros. Television for one of the big 3 American commercial networks – as opposed to cable, which has come to be seen as the font of American “quality television”. At its peak (in its third season, 2001-2002), it “ranked tenth in the ratings with a weekly audience of more than seventeen million.” (20) It generated intense interest from television critics, but also from political commentators across the spectrum; indeed, its idealistic, even romantic vision of American politics has continued to prove an inspiration (http://www.vanityfair.com/politics/2012/04/aaron-sorkin-west-wing; accessed 13 March 2013). Yet while Buffy the Vampire Slayer (1997-2003) and The Sopranos (1999-2007), to name two of its contemporaries in the Quality TV Canon, have generated reams of scholarship, McCabe’s is only the second book-length study of The West Wing, following The West Wing: The American Presidency as Television Drama (eds. Peter C. Rollins and John E. O’Connor, Syracuse University Press, 2003). As such, McCabe’s book is an important corrective to the show’s relative neglect in recent years. These sorts of slim volumes have difficult needles to thread. To borrow from the website description, a TV Milestones series book must be comprehensive yet detailed; “critical but accessible and lively”; and “suitable for students, scholars and general readers alike.” (http://wsupress.wayne.edu/books/series-and-imprints; accessed 13 March 2013) In a mere 118 pages, and those 5 by 7 inches and including a number of well-chosen promotional stills and frame grabs, McCabe covers a lot of territory. She frames the book around an incisive interrogation of notions of “quality television” as exemplified by The West Wing, grounding it in ideas about the “public service broadcasting” contract, and demonstrating the importance of the show in forging a model of quality fare in a commercial television context (as constrained by standards and practices, for instance) for an upscale demographic (both in the United States and globally). “Studying the media history,” she writes, “reveals that [The West Wing] mattered because it mattered to those who mattered.” (9) She proceeds from there to a consideration of series creator Aaron Sorkin as a TV auteur, authorship being central to discourses of TV quality. Analyzing Sorkin’s authorship of the show in its first four seasons, she examines his narrative techniques, use of language, and indebtedness to the screwball comedy, always returning to resonances between favored strategies, the show’s model of political philosophies and practices, and, in the case of romcom-inflected storylines, its depiction of gender. Having shown how the show’s tone and dramatic style shifted when Sorkin left the show, his role as executive producer being filled by John Wells for the 5th, 6th, and 7th seasons, McCabe proceeds to a discussion of The West Wing’s televisual style. There too, the template was set by one dominant figure, director Thomas Schlamme, who, along with director of photography Thomas Del Ruth, set norms for the use of the Steadicam, for the warm color palette, and for chiaroscuro lighting designs that held until each left the show (Schlamme with Sorkin at the end of season 4, and Del Ruth at the end of season 5, to be replaced by Michael Mayers). She then looks at tonal shifts and variations in the final seasons, as yet more shadows and colder, more muted colours matched the increasing darkness of the narrative. Most notably, she examines the more documentary-influenced, faster-cut style used in scenes set on the campaign trail in the last two seasons, though there is more to be said there about the contrast between one distinct visual style used for the campaign sequences, and the continuation of the show’s original long-take, Steadicam-oriented approach to those scenes set in the White House. Covering so many bases in such a short space means that such a book can never exhaust the subject matter. Many readers, especially those with some sort of investment in The West Wing, are sure to be left wanting more along one line of inquiry or another. For my part, I was left wishing for a more systematic, rigorous account of style in the show; for example, what precisely does a “romantic visual quality” (60) entail? The West Wing was notably sophisticated not only in its mobile camerawork, color, and lighting, all of which McCabe touches on, but also its staging, framing, and editing. Of course, such rigour, and the terminological density it requires, would likely alienate a general-interest reader. Finally, then, this partly speaks to the real value of series like this. Such volumes can be useful as introductory texts for lecturers looking to tailor class readings to their screenings, or students looking for a place to start their research; in this regard, there is a great deal of use here, from McCabe’s gloss on the question of “quality television” to her navigation of the political discourses running through the series. But also, ideally such books should open avenues for exploration, should spark questions and point to concerns that other scholars can and should address. They cannot exhaust, but they can entice, inspire, provoke; they can pick up the torch and pass it on. McCabe’s book accomplishes this admirably: without putting a foot seriously wrong, she summarizes the state of thought on The West Wing whilst leaving plenty of room for future scholars to carry on from there.